Bangalore, Karnataka, India: Do you know who offers a postgraduate programme in India in communicating science? Where can one study conservation that focuses on issues like conservation psychology, conservation finance, multilateralism? Is there a course on quality assurance and regulatory affairs that is developed with industry? Can one study computer science course that offers training in pervasive computing, data mining and informatics combined into one taught by the industry? Do our students get to know how agencies like the United Nations functions? These are some of the questions that are being answered by The Institute of Transdisciplinary Health Sciences and Technology, TransDisciplinary University (TDU) at its academic programme launch for 2017-18. 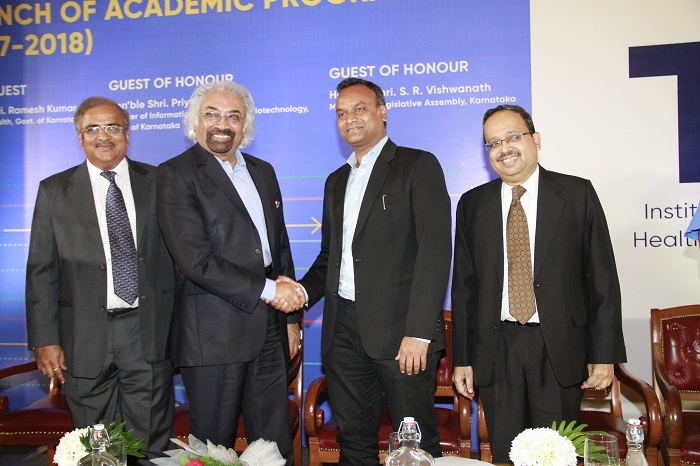 Founded by veterans, Dr. Sam Pitroda and Darshan Shankar, the TDU aims to lead innovation in higher education with an objective of providing unique opportunities to students and scholars across the board while fostering a positive societal change. Speaking about the Institute’s initiatives, Dr. Balakrishna Pisupati - Vice-chancellor, TDU, said, “We at TDU focus on designing and deploying innovative and novel courses, both for study and research, using modern technology and tools. The TDU attempts to provide affordable, scalable and sustainable for life-long learning that is responsive and relevant. Using federated structure, courses at TDU are offered by a range of institutions and partners, including the United Nations, both from India and abroad”. Established with a mandate to formalize trans and inter-disciplinary approaches in education and research, the TDU emphasizes continuous and experiential learning with all its courses designed in consultation with experts that including the industry, civil society and government agencies. Focused on providing an atmosphere of free and fair learning opportunities, not based on one’s economic background but instead on intellectual inquisitiveness, the University offers equal opportunities for interested students who are passionate about learning. The TDU functions through two schools currently. The School of Liberal Arts and Sciences that focuses on topics such as conservation, communication, law and policy and data science, while the School of Integrative Sciences that focus on areas such as life sciences, local health traditions, ethno veterinary sciences and clinical research. The Schools offer programmes that are both academic and research-oriented, with a range of Undergraduate, Post-graduate, Doctoral and Post-Doctoral programmes. They also offer a series of certificate and Post-Graduate Diploma programmes. Admissions for the academic year 2017-2018 will be open through May 2017. For further information, interested candidates can get in touch with the Registrar of the University (admissions@tdu.edu.in; fellowships@tdu.edu.in), and order a copy of the prospectus and related documents. TDU offers a limited number of Fellowships and Scholarships for deserving students based on competitive assessment of students. Do you know who offers a postgraduate programme in India in communicating science? Where can one study conservation that focuses on issues like conservation psychology, conservation finance, multilateralism? These are some of the questions that were answered by The Institute of TransDisciplinary Health Sciences and Technology, TransDisciplinary University (TDU) at its academic programme launch for 2017-18.